Analytics gives you the facility to interrogate your data a bit more. 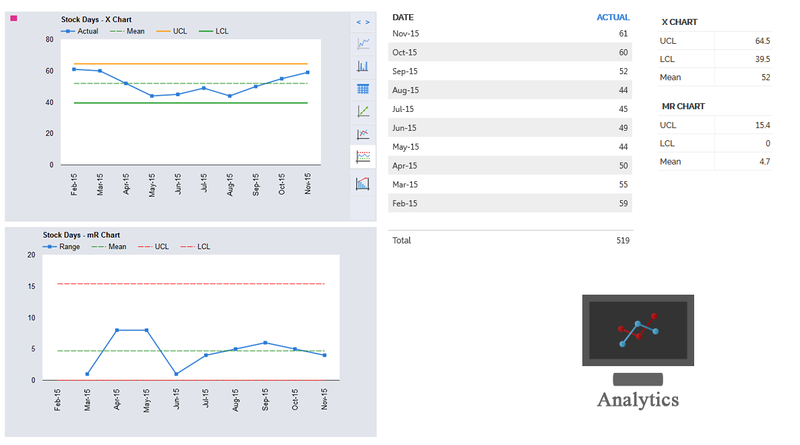 You can change your graph type, view the data results, ascertain variance and observe trends. You can also compare two KPIs for comparison, simply select "Select KPI for Comparison" from the drop down box. The more in-depth analytics are contained in the XMR Charts. You'll need some understanding of its functionality to make good use of this, but fundamentally, XMR looks at process variation rather that period to period comparison. A useful tool to prevent knee jerk reactions to variances. Graph types include: Line, Bar, Table, Linear Trend, Year on Year, XMR, Pareto, and Stacked. Linear trend graph also includes a calculation for R2 - this measure determines the reliability of the trend as a forecasting measure. For further information, refer to "What is?" button or refer to our Blog for more insight.